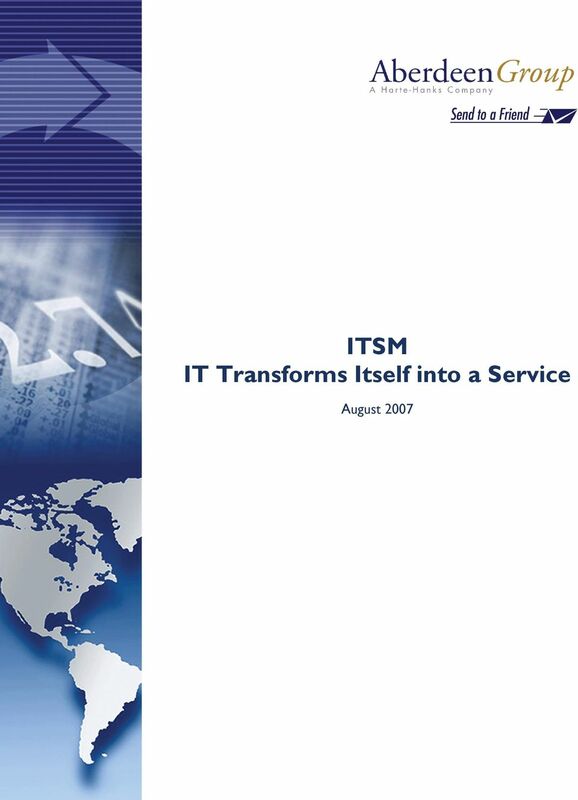 Download "ITSM IT Transforms Itself into a Service"
5 Page 5 Chapter One: Benchmarking the Best-in-Class IT Management: Aberdeen Analysis Amid the pressures businesses face to stay competitive in a global economy, today s information technology organization must adequately service the provisioning of critical technological functionality especially in key areas such as application and network access as if it were a self-supporting business. This is prompting the transformation of the IT organization from one historically focused on technical knowledge to one focused on providing technology to the rest of the business. Due in part to outsourcing and the arrival of -Oriented Architecture (SOA) and Software as a (SaaS), IT now has to manage a mélange of services that are both internal and external to the company. Given these pressures and a focus on delivery performance, how does IT drive business value for the organization? 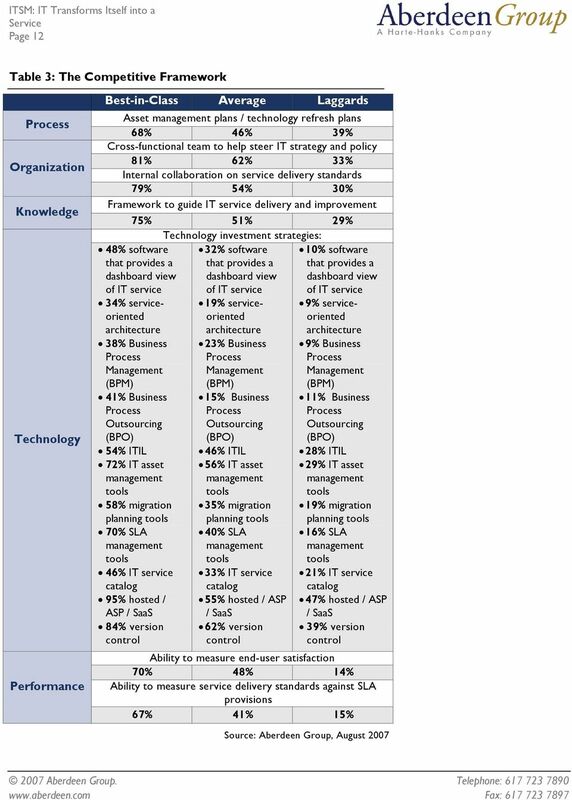 Figure 1: Top Pressures for IT Management 60% 54% All Respondents Fast Facts 38% of Best-in-Class are currently using Business Process Management (BPM) software as an ITSM solution vs. 9% of Laggards Best-in-Class companies are twice as likely to use hosted / ASP / SaaS models than Laggards 28% of Best-in-Class dedicate more than 20% of their overall IT budget to ITSM vs. 10% of Laggards 50% 40% 30% 20% 10% 36% 32% 20% 18% 0% Customer Expectations Cost of maintaining IT infrastructure Business continuity Competition Cost of deploying IT resources What is IT Management? IT Management (ITSM) is a process-based practice intended to align the delivery of IT services with needs of the enterprise, while highlighting benefits to customers both internal and external. It combines proven methods such as process management and known industry best practices in the area of ITSM, to enable any organization to deliver quality IT services that satisfy customer business needs and achieve performance targets specified within SLAs. ITSM is about disaggregating IT, which traditionally was focused on managing IT as individual silos, to that of individual components focused on the delivery of end-to-end services using best practice process models. ITSM attempts to put the customer relationship first, by replacing the emphasis on an IT centered mindset to a customer service one. 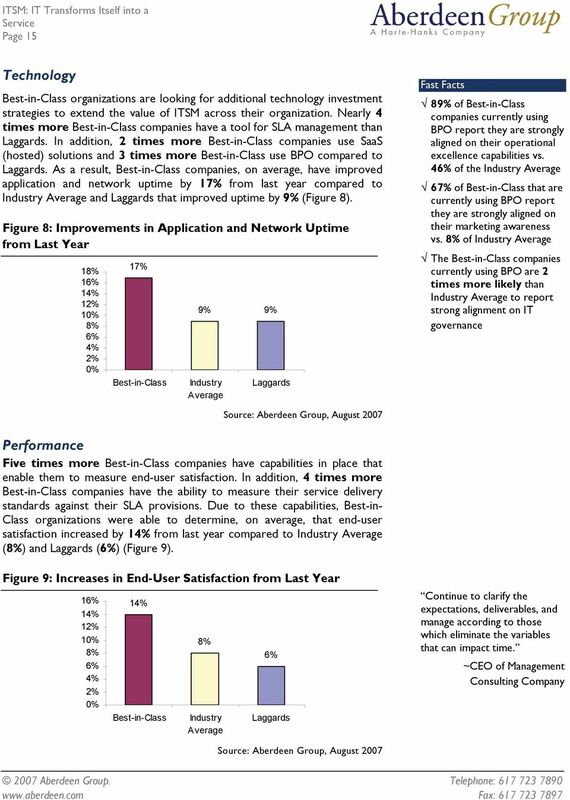 7 Page 7 Maturity Class Framework Aberdeen used three key performance criteria to distinguish Best-in-Class companies from Industry Average and Laggard organizations. These KPIs are the operational metrics frequently considered to be the key benefits to an effective ITSM solution: (1) the percentage of SLA goals met; (2) the improved delivery times of IT services; and (3) the increased efficiency of IT processes. Table 1 summarizes these findings and defines Best-in-Class performance for this study. 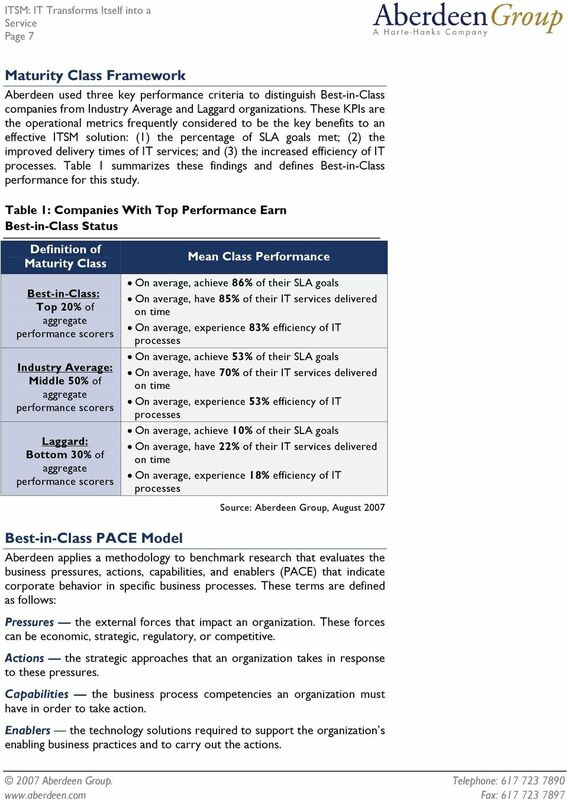 Table 1: Companies With Top Performance Earn Best-in-Class Status Definition of Maturity Class Best-in-Class: Top 20% of aggregate performance scorers Industry Average: Middle 50% of aggregate performance scorers Laggard: Bottom 30% of aggregate performance scorers Mean Class Performance On average, achieve 86% of their SLA goals On average, have 85% of their IT services delivered on time On average, experience 83% efficiency of IT processes On average, achieve 53% of their SLA goals On average, have 70% of their IT services delivered on time On average, experience 53% efficiency of IT processes On average, achieve 10% of their SLA goals On average, have 22% of their IT services delivered on time On average, experience 18% efficiency of IT processes Best-in-Class PACE Model Aberdeen applies a methodology to benchmark research that evaluates the business pressures, actions, capabilities, and enablers (PACE) that indicate corporate behavior in specific business processes. These terms are defined as follows: Pressures the external forces that impact an organization. These forces can be economic, strategic, regulatory, or competitive. Actions the strategic approaches that an organization takes in response to these pressures. Capabilities the business process competencies an organization must have in order to take action. Enablers the technology solutions required to support the organization s enabling business practices and to carry out the actions. 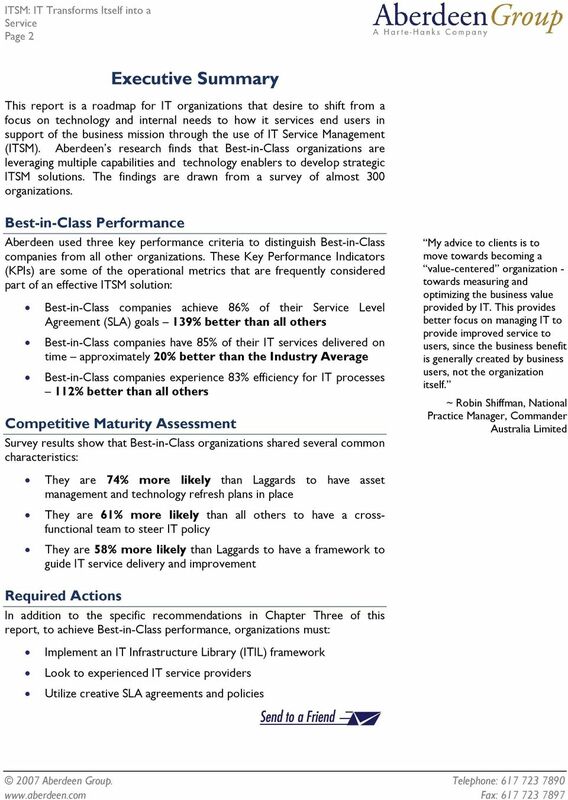 8 Page 8 Using ITSM solutions to achieve Best-in-Class performance requires a combination of strategic actions, organizational capabilities, and enabling technologies. Table 2 identifies the top pressures, actions, capabilities, and technology enablers that enterprises are using to help IT drive value across the company. Table 2: Best-in-Class PACE Framework Pressures Actions Capabilities Enablers Meet quality of customer service expectations from internal and external users Improve process alignment between IT and the business units Adopt / modify / enforce SLAs Ability to measure application and network uptime Crossdisciplinary team that helps steer IT strategy and policies Internal collaboration on service delivery standards Hosted / ASP / SaaS models IT asset management software SLA management software ITIL IT service catalog Software that provides a dashboard view The Best-in-Class actions in Table 2 show that top performing organizations are using a variety of technology enablers to solve their IT service management problems. Table 2 identifies the top pressure as the need to meet the quality of customer service expectations from internal and external users cited by 54% of survey respondents. The top two strategic actions to combat this pressure are to improve process alignment between IT and the business units and to adopt, modify, and enforce SLAs within the organization. Figure 3 shows how organizations are strategically approaching the challenges identified in Figure 1. 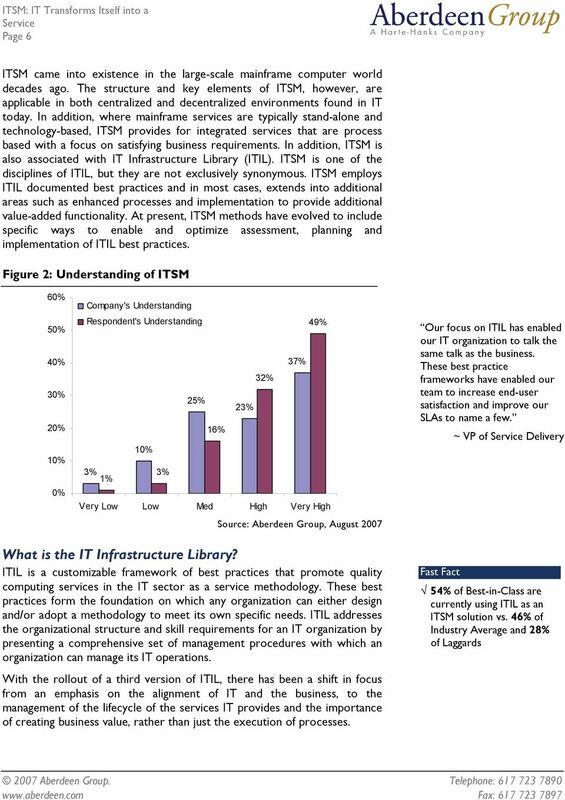 Fast Fact 53% of Best-in-Class are currently using ITIL as an ITSM solution vs. 44% of Industry Average and vs. 28% of Laggards. 9 Page 9 Figure 3: Top Five Strategic Actions to ITSM Pressures Improve process alignment betw een IT and the business units 86% Adopt / modify / enforce SLAs 63% Adopt internal compliance policies 55% Outsource IT infrastructure 21% Hire IT staf f 19% All Respondents 0% 20% 40% 60% 80% 100% Aberdeen Insights Strategy Companies can gain visibility into their business processes using SLA management tools to more effectively adopt, modify, and enforce their SLAs to move towards increased efficiency of IT processes, increased percentages of SLA goals achieved, and improvements in IT service delivery times. What the top strategic action implies is that companies need to look to adopting an ITIL framework (perhaps ITIL version 2) to help improve process alignment between IT and the business units. Once an organization has this in place, they can look to manage the lifecycle of IT services rather than just execute them. IT organizations can then conduct ITSM audits to measure KPIs to look at growth and value, budget adherence, risk impact, and communication effectiveness. An ITSM audit allows executives and IT management to determine the status of various processes and identify potential problem areas. In the next chapter, we will see what the top performers are doing to drive business value across the enterprise. 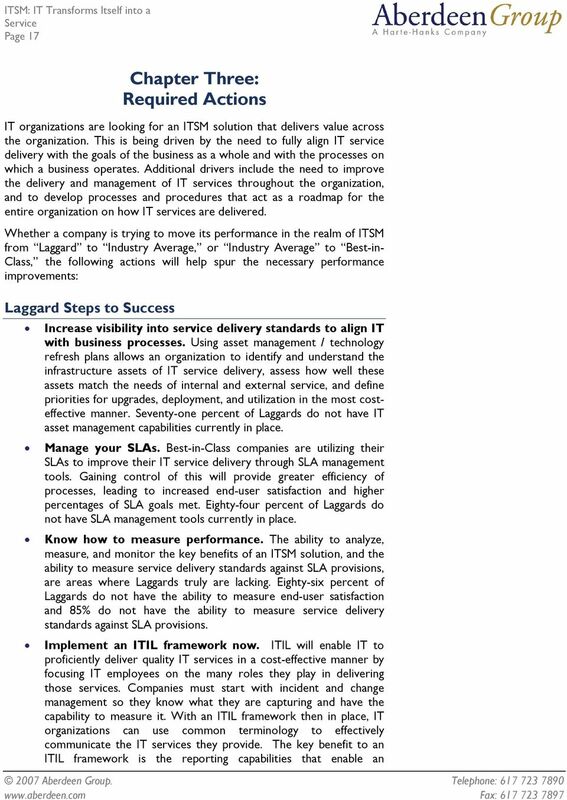 10 Page 10 Chapter Two: Benchmarking Requirements for Success The selection of an ITSM solution, and its subsequent integration with business intelligence and business process management systems plays a crucial role in the ability to turn these strategies into profit. 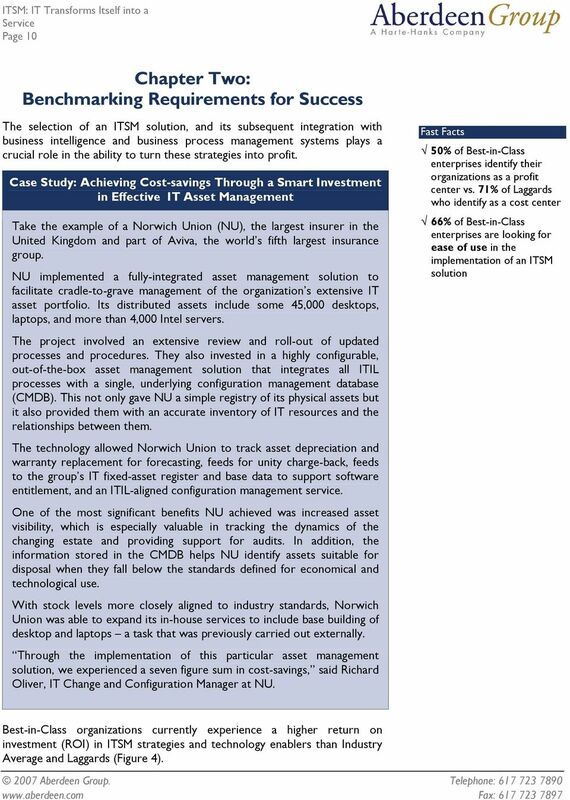 Case Study: Achieving Cost-savings Through a Smart Investment in Effective IT Asset Management Take the example of a Norwich Union (NU), the largest insurer in the United Kingdom and part of Aviva, the world s fifth largest insurance group. NU implemented a fully-integrated asset management solution to facilitate cradle-to-grave management of the organization s extensive IT asset portfolio. Its distributed assets include some 45,000 desktops, laptops, and more than 4,000 Intel servers. The project involved an extensive review and roll-out of updated processes and procedures. They also invested in a highly configurable, out-of-the-box asset management solution that integrates all ITIL processes with a single, underlying configuration management database (CMDB). This not only gave NU a simple registry of its physical assets but it also provided them with an accurate inventory of IT resources and the relationships between them. The technology allowed Norwich Union to track asset depreciation and warranty replacement for forecasting, feeds for unity charge-back, feeds to the group s IT fixed-asset register and base data to support software entitlement, and an ITIL-aligned configuration management service. One of the most significant benefits NU achieved was increased asset visibility, which is especially valuable in tracking the dynamics of the changing estate and providing support for audits. In addition, the information stored in the CMDB helps NU identify assets suitable for disposal when they fall below the standards defined for economical and technological use. With stock levels more closely aligned to industry standards, Norwich Union was able to expand its in-house services to include base building of desktop and laptops a task that was previously carried out externally. Through the implementation of this particular asset management solution, we experienced a seven figure sum in cost-savings, said Richard Oliver, IT Change and Configuration Manager at NU. Fast Facts 50% of Best-in-Class enterprises identify their organizations as a profit center vs. 71% of Laggards who identify as a cost center 66% of Best-in-Class enterprises are looking for ease of use in the implementation of an ITSM solution Best-in-Class organizations currently experience a higher return on investment (ROI) in ITSM strategies and technology enablers than Industry Average and Laggards (Figure 4). 13 Page 13 Organizational Capabilities and Technology Enablers The essential ingredients of a well-designed ITSM strategy include process, organization, knowledge management, and technology enablers that, when combined, form a working solution that translates to more effective and profitable working conditions for an organization. 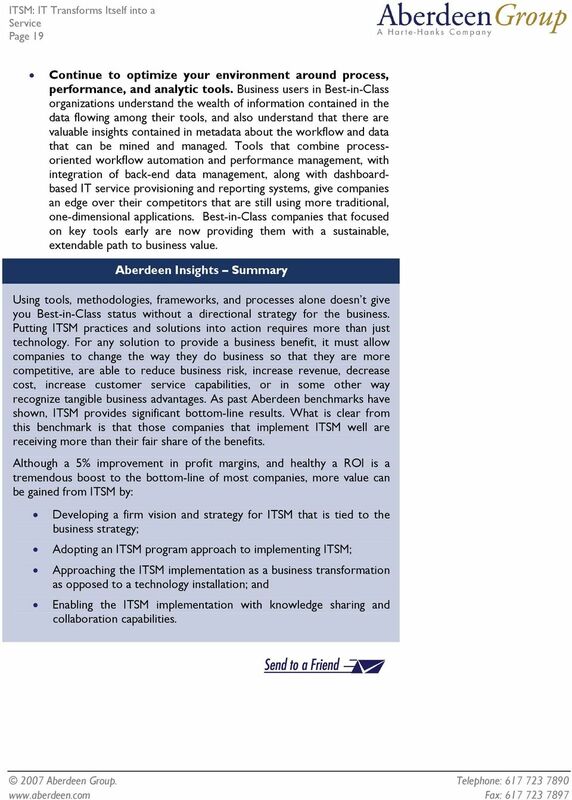 Process Aberdeen research has found that 68% of Best-in-Class organizations have asset management / technology refresh plans in place to help improve ITSM performance. As a result, Best-in-Class companies have experienced an average cost-savings of 17% from last year compared to Laggards, who experienced an average cost savings of 8% from last year (Figure 5). Figure 5: Cost Savings from Last Year 18% 16% 14% 12% 10% 8% 6% 4% 2% 0% 17% Best-in-Class 9% Industry Average 8% Laggards The first and most important step to increase SLA goals met over time is to ensure that the IT group does not overpromise and under-deliver. The IT group must understand its capability to deliver and the best way to ensure this is to measure (through tools and processes) the capability of the IT organization. Once measures are in place and outputs come from them, the IT group can understand and take steps to improve. ~Chris Howard, IT Director, State Revenue Office, Victoria, Australia Organization Seventy-nine percent of Best-in-Class organizations have internal collaboration on service delivery standards within the organization. The use of cross-functional teams (CFTs), made up of contributors across and enterprise, is not new by any measure. Eighty-one percent of Best-in- Class companies have exploited their internal capabilities in this area by creating teams made of IT, service delivery, and business analysts who understand the specific domain to help in the creation and design of user and system requirements. Having a CFT in place has enabled Best-in-Class companies to increase the percentage of SLA goals met last year by 22% compared to 8% for Laggards (Figure 6). 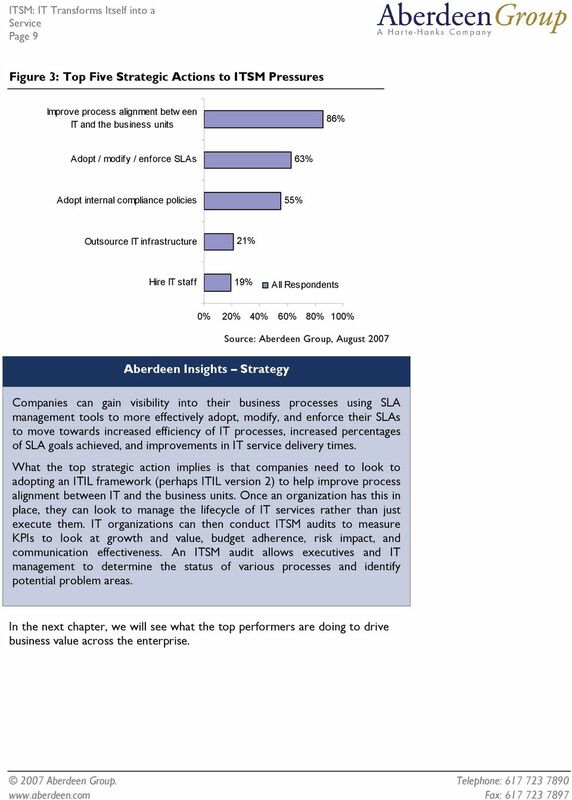 16 Page 16 Aberdeen Insights Technology When Aberdeen measured the top pressures for organizations, the data pointed to customer expectations, as well as the cost of maintaining the IT infrastructure. These are the true drivers behind Best-in-Class actions. 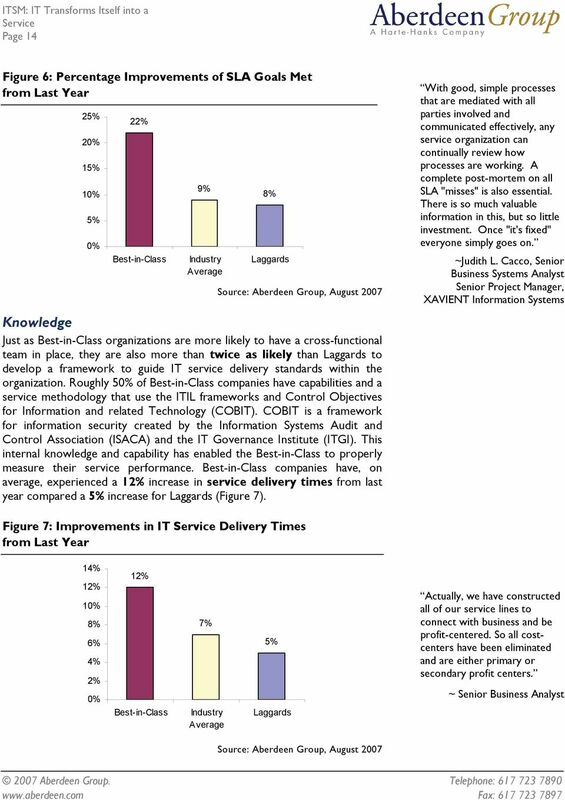 The Best-in-Class were able to lower the cost of maintaining and deploying IT by focusing their initiatives on SLA management, on-time delivery of services, unique service delivery models and technical platforms, as well as efficiency of IT processes. 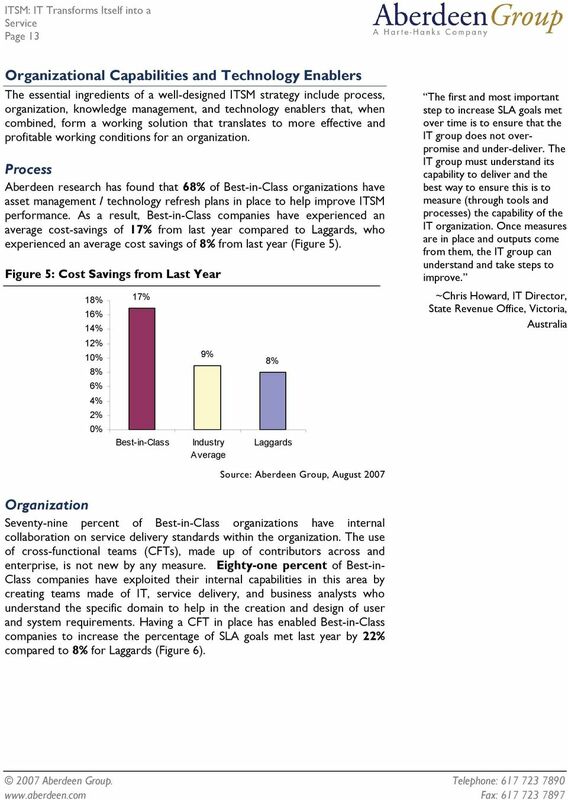 Aberdeen research also showed that Best-in- Class service organizations identified as profit-centers are dedicating more of their overall IT budgets to ITSM (more than 20%), while the majority of cost-centers are spending (less than 5%). 18 Page 18 organization to get the metrics they need to improve SLAs both internally and externally, increase the understanding of the organization's current IT capability, increase the flexibility and adaptability of services, enhance customer satisfaction, and improve the security, performance and availability of all IT services. 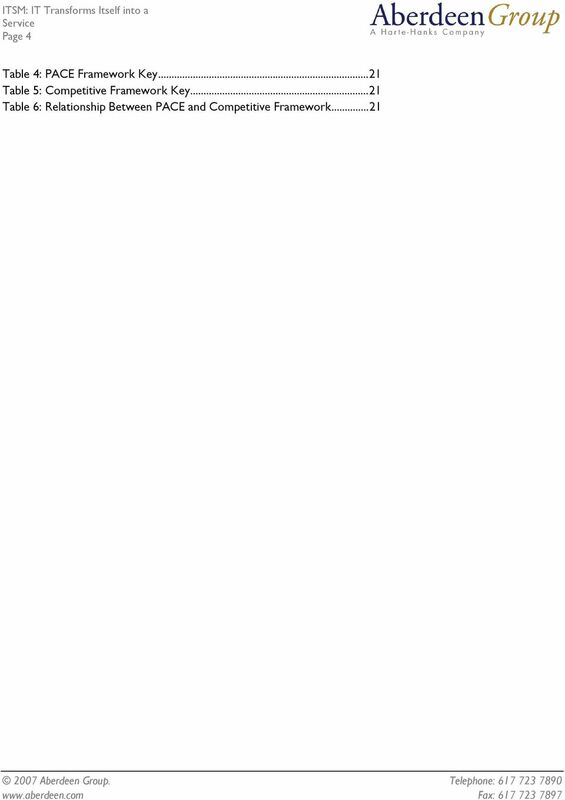 Seventytwo percent of Laggards do not have an ITIL framework in place. 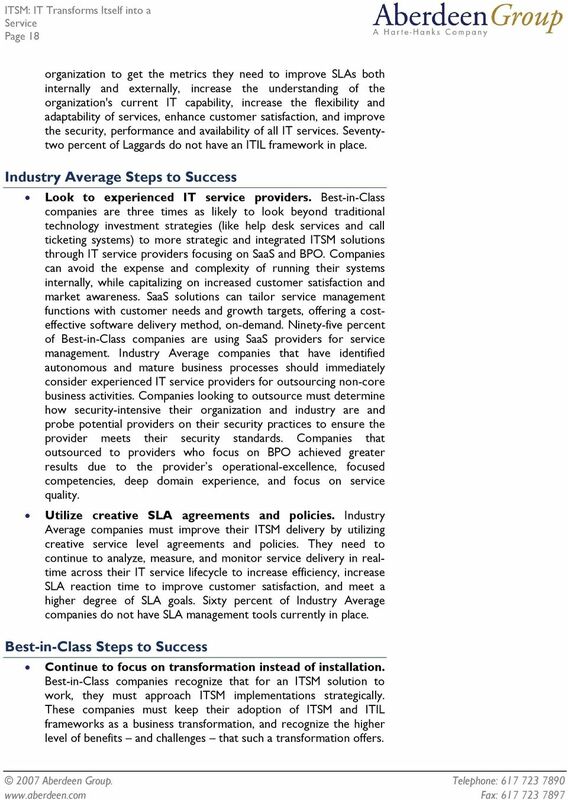 Industry Average Steps to Success Look to experienced IT service providers. Best-in-Class companies are three times as likely to look beyond traditional technology investment strategies (like help desk services and call ticketing systems) to more strategic and integrated ITSM solutions through IT service providers focusing on SaaS and BPO. Companies can avoid the expense and complexity of running their systems internally, while capitalizing on increased customer satisfaction and market awareness. SaaS solutions can tailor service management functions with customer needs and growth targets, offering a costeffective software delivery method, on-demand. Ninety-five percent of Best-in-Class companies are using SaaS providers for service management. Industry Average companies that have identified autonomous and mature business processes should immediately consider experienced IT service providers for outsourcing non-core business activities. Companies looking to outsource must determine how security-intensive their organization and industry are and probe potential providers on their security practices to ensure the provider meets their security standards. Companies that outsourced to providers who focus on BPO achieved greater results due to the provider s operational-excellence, focused competencies, deep domain experience, and focus on service quality. Utilize creative SLA agreements and policies. Industry Average companies must improve their ITSM delivery by utilizing creative service level agreements and policies. They need to continue to analyze, measure, and monitor service delivery in realtime across their IT service lifecycle to increase efficiency, increase SLA reaction time to improve customer satisfaction, and meet a higher degree of SLA goals. Sixty percent of Industry Average companies do not have SLA management tools currently in place. Best-in-Class Steps to Success Continue to focus on transformation instead of installation. Best-in-Class companies recognize that for an ITSM solution to work, they must approach ITSM implementations strategically. These companies must keep their adoption of ITSM and ITIL frameworks as a business transformation, and recognize the higher level of benefits and challenges that such a transformation offers. 19 Page 19 Continue to optimize your environment around process, performance, and analytic tools. Business users in Best-in-Class organizations understand the wealth of information contained in the data flowing among their tools, and also understand that there are valuable insights contained in metadata about the workflow and data that can be mined and managed. Tools that combine processoriented workflow automation and performance management, with integration of back-end data management, along with dashboardbased IT service provisioning and reporting systems, give companies an edge over their competitors that are still using more traditional, one-dimensional applications. Best-in-Class companies that focused on key tools early are now providing them with a sustainable, extendable path to business value. Aberdeen Insights Summary Using tools, methodologies, frameworks, and processes alone doesn t give you Best-in-Class status without a directional strategy for the business. Putting ITSM practices and solutions into action requires more than just technology. For any solution to provide a business benefit, it must allow companies to change the way they do business so that they are more competitive, are able to reduce business risk, increase revenue, decrease cost, increase customer service capabilities, or in some other way recognize tangible business advantages. 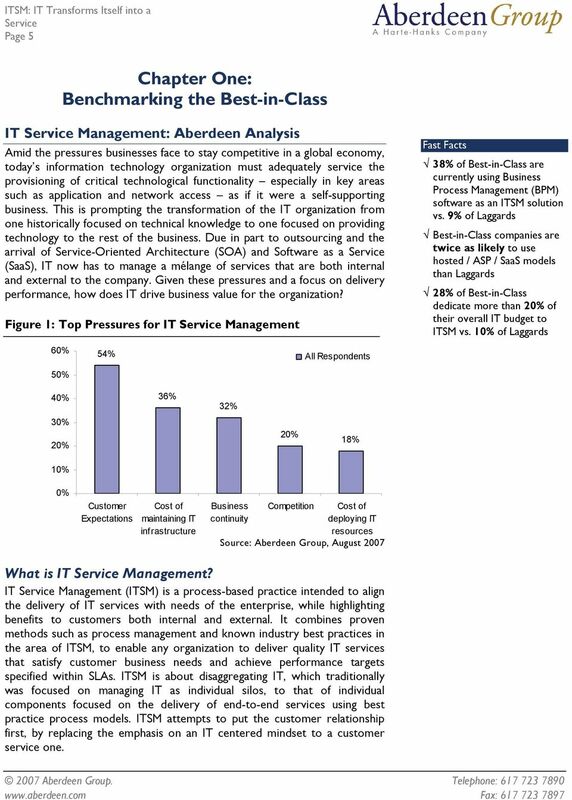 As past Aberdeen benchmarks have shown, ITSM provides significant bottom-line results. What is clear from this benchmark is that those companies that implement ITSM well are receiving more than their fair share of the benefits. Although a 5% improvement in profit margins, and healthy a ROI is a tremendous boost to the bottom-line of most companies, more value can be gained from ITSM by: Developing a firm vision and strategy for ITSM that is tied to the business strategy; Adopting an ITSM program approach to implementing ITSM; Approaching the ITSM implementation as a business transformation as opposed to a technology installation; and Enabling the ITSM implementation with knowledge sharing and collaboration capabilities. 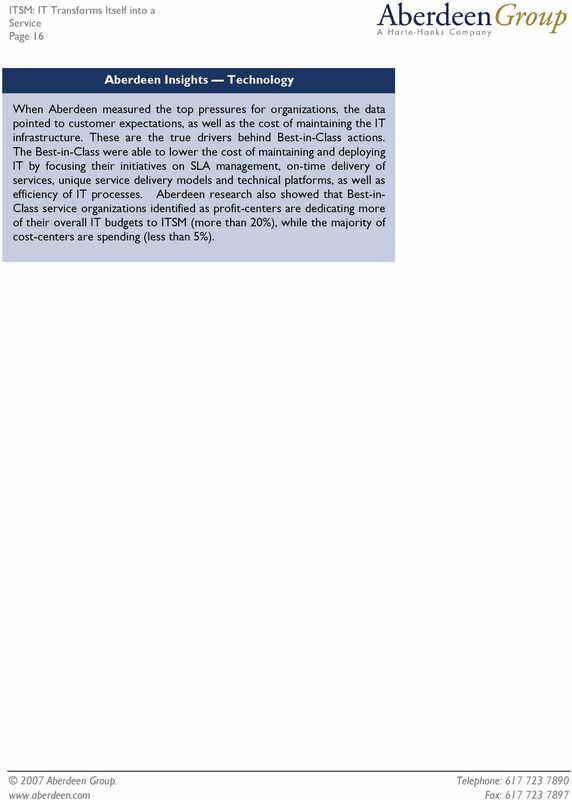 20 Page 20 Appendix A: Research Methodology Between July and August 2007, Aberdeen Group examined the role of IT Management (ITSM) in driving value across an enterprise. 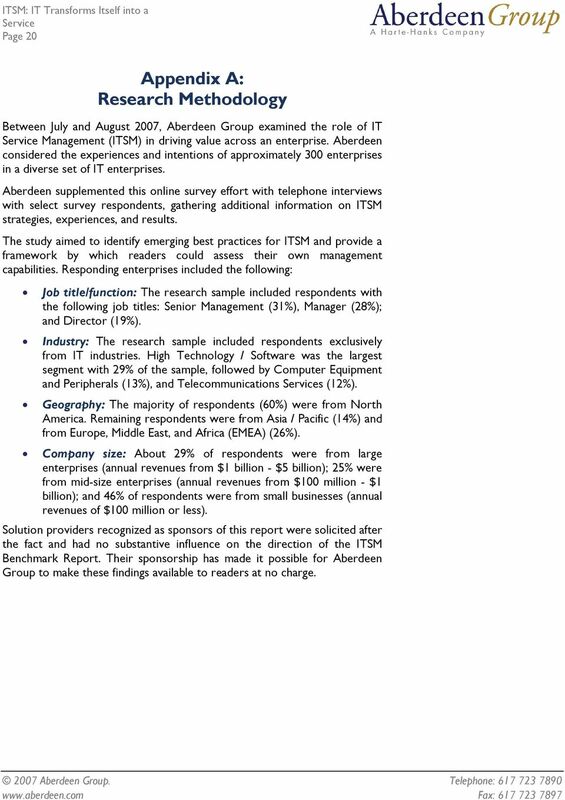 Aberdeen considered the experiences and intentions of approximately 300 enterprises in a diverse set of IT enterprises. Aberdeen supplemented this online survey effort with telephone interviews with select survey respondents, gathering additional information on ITSM strategies, experiences, and results. The study aimed to identify emerging best practices for ITSM and provide a framework by which readers could assess their own management capabilities. Responding enterprises included the following: Job title/function: The research sample included respondents with the following job titles: Senior Management (31%), Manager (28%); and Director (19%). Industry: The research sample included respondents exclusively from IT industries. High Technology / Software was the largest segment with 29% of the sample, followed by Computer Equipment and Peripherals (13%), and Telecommunications s (12%). Geography: The majority of respondents (60%) were from North America. Remaining respondents were from Asia / Pacific (14%) and from Europe, Middle East, and Africa (EMEA) (26%). Company size: About 29% of respondents were from large enterprises (annual revenues from $1 billion - $5 billion); 25% were from mid-size enterprises (annual revenues from $100 million - $1 billion); and 46% of respondents were from small businesses (annual revenues of $100 million or less). Solution providers recognized as sponsors of this report were solicited after the fact and had no substantive influence on the direction of the ITSM Benchmark Report. Their sponsorship has made it possible for Aberdeen Group to make these findings available to readers at no charge. 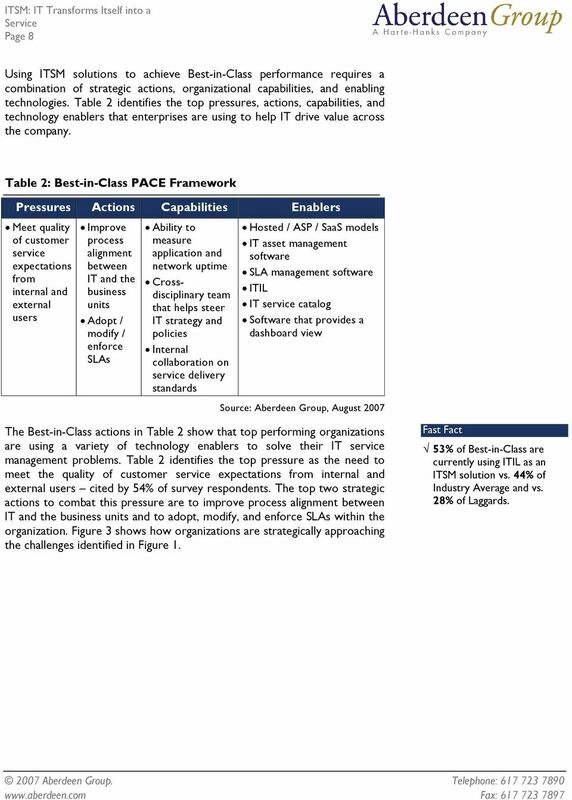 21 Page 21 Table 4: PACE Framework Key Overview Aberdeen applies a methodology to benchmark research that evaluates the business pressures, actions, capabilities, and enablers (PACE) that indicate corporate behavior in specific business processes. These terms are defined as follows: Pressures external forces that impact an organization s market position, competitiveness, or business operations (e.g., economic, political and regulatory, technology, changing customer preferences, competitive) Actions the strategic approaches that an organization takes in response to industry pressures (e.g., align the corporate business model to leverage industry opportunities, such as product/service strategy, target markets, financial strategy, go-to-market, and sales strategy) Capabilities the business process competencies required to execute corporate strategy (e.g., skilled people, brand, market positioning, viable products/services, ecosystem partners, financing) Enablers the key functionality of technology solutions required to support the organization s enabling business practices (e.g., development platform, applications, network connectivity, user interface, training and support, partner interfaces, data cleansing, and management) Table 5: Competitive Framework Key Overview The Aberdeen Competitive Framework defines enterprises as falling into one of the following three levels of practices and performance Best-in-Class (20%) Practices that are the best currently being employed and significantly superior to the Industry Average, and result in the top industry performance. Industry Average (50%) Practices that represent the average or norm, and result in average industry performance. Laggards (30%) Practices that are significantly behind the average of the industry, and result in below average performance In the following categories: Process What is the scope of process standardization? What is the efficiency and effectiveness of this process? Organization How is your company currently organized to manage and optimize this particular process? Knowledge What visibility do you have into key data and intelligence required to manage this process? Technology What level of automation have you used to support this process? How is this automation integrated and aligned? Performance What do you measure? How frequently? What s your actual performance? Table 6: Relationship Between PACE and Competitive Framework PACE and Competitive Framework How They Interact Aberdeen research indicates that companies that identify the most impactful pressures and take the most transformational and effective actions are most likely to achieve superior performance. The level of competitive performance that a company achieves is strongly determined by the PACE choices that they make and how well they execute.